The Boss CS-3 compression sustainer compact guitar effects pedal is the 'go-to' pedal for playing clean melodic guitar lines. Cutting through the overall mix in a band during a gig with sustained clean notes can be a difficult thing to achieve. Many players end up using light overdrive or distortion as a compromise to lift the signal in the mix, but obviously this isn't quite the same. Depending on where your pedal is in the signal chain, it can cause your desired tone to become a little grittier than intended, or even change the tonality of your signal completely. Thanks to the CS-3 it needn't be difficult. This little beauty smoothes the sound by flattening dynamics, giving your lines a consistent output level without adding hiss, buzz or distortion. Rather than focusing on hard limiting your dry signal, the Boss CS-3 keeps the signal at a continuous level by limiting the louder notes, and compensating for loss of gain as notes decay by introducing a subtle lift. You can set the attack to be fast for a smoother sound, or slow for more pronounced articulation. The sustain setting lets you choose how long the CS-3's compressor remains active, before it lets your notes decay. A short sustain will enable greater articulation, whereas a longer sustain will keep the compressor active for maximum smoothness. 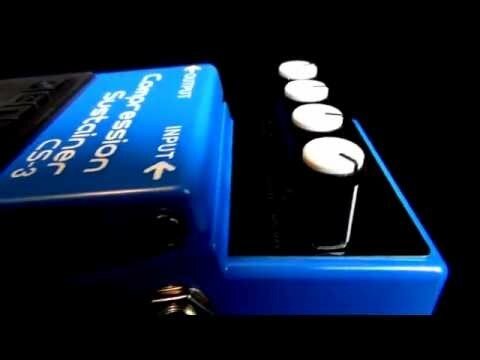 As compression naturally decreases the top end there is a tone control that will let you adjust the amount of top end to compensate, so that those killer leads are executed with the utmost tonal accuracy. For added wow factor you could try adding chorus and delay effects after the compressor in the signal chain, to give your lead tones a sweeter and more powerful voice. The compressed signal will get good results from many effects, modulation effects in particular. However, it is always worth playing about with the settings on the CS-3 to suit the other pedals in your signal chain, in order to get the result you desire. Whether you're just starting out and finding your feet with regard to your setup and tone, or are a professional who knows what they're after and demand consistency and reliability, then the Boss CS-3 compression/sustainer compact guitar effects pedal is an absolute must have. If you want your rhythm chops to live up to their full potential, and need your leads to soar, then this magic little box will guarantee that your demands are met. Not only that but it is built like an absolute tank, so you can rest assured that it can handle anything you can throw at it.